The gentle pH balanced formula is enriched with ingredients to clean, refresh, remove odours and moisturise the skin. Suitable for everyday use on the body, face and hair. Most importantly, no water is required upon application. 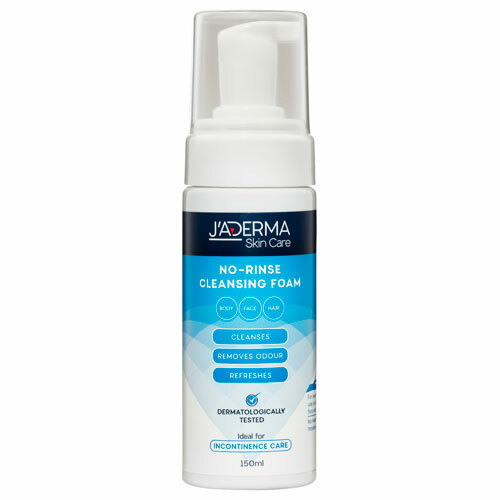 J’ADERMA Skin Care products can be used in combination as a 3-step process, or used individually. Caution: For external use only. Avoid contact with eyes. May cause eye irritation. Rinse eyes with water if contact should occur. Consult a physician if irritation persists. In rare cases of sensitivity, discontinue use. Pump foam onto a wash-cloth or directly onto soiled or odorous areas. Gently wipe clean to remove residue. Pump foam onto dry hair. Using fingers, gently rub in the foam until hair is fully covered. Towel dry. Repeat as required.